Overall this is a serviceable headset for a reasonable price. It’s not totally in the doldrums but neither should you expect fireworks, but it is definitely best for PC gamers playing action-shooters. Roccat is increasingly a well-known and established manufacturer of gaming goods and gear that has a German-efficiency stamp of approval. Usually. I was a little underwhelmed by the Roccat Khan Aimo, which was good but flawed, so I was simultaneously intrigued and surprised to see a lower-end of the budget scale headset from Roccat come through our doors for review. 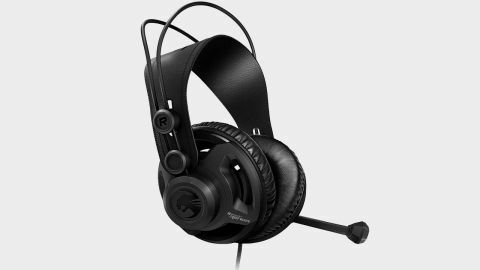 The Renga Boost headset is compatible with PC, PS4, Xbox One, and Switch (and everything else you might want headphones for) and represents Roccat’s cheapest headset option. Given the prevalence of contemporary design styles that have generally been accepted in modern gaming headsets, like solid headbands and solid-looking and feeling earcups, the Renga Boost is a little odd looking. Only in aesthetic terms really, because the headband is split into two distinct parts - a soft faux leather strap that fits against your head and two wire-containing narrow bands that rise above. This contributes to the headsets lightness which is great - you really won’t feel them as a burden on your head weight wise. The circular earcups have a sort of open design with bits semi-exposed which is fine - you won’t see them when you’re wearing them. And they are still passable in terms of what will greet onlookers who see you wearing them. Nothing offensive or alien-looking here. The earcups, with their open nature, do help toward the weightlessness too, but if only it was a bit more comfortable overall - more on that later. Simple starts and all that: what's in the box? Simple and no complexity as you might expect with a very competitively priced headset: just the headset and its long wire - mic and headset jacks with a single adaptor already connected - and the usual quick start setup guide and warranty information booklets. That’s it. And it's also one of the reasons why headsets are a great peripheral as you can usually plug and go straight out the box. First impressions here were that the cable was enormously long. And when I sat down to test it with the PS4 it just felt like an absolute nuisance. Because it was. You have to do some cable management with the wires immediately if you want to use it on console. The length of the cable must be tied to its compatibility for PC (with cables going around the back of monitors and to the back of machines). Perhaps this highlights the design quirk that when headsets are compatible for all (and are wired) the length of the cable will always be aimed at the PC users. The mic flips up and down neatly enough - though it doesn’t auto mute in the upright position and it is nondetachable. There’s also a switch on the cable wire for volume and switching the mic on or off, which were effective, but felt a bit plasticky and ‘stuck on’. As is usual in our testing of headsets, I made sure to give it a spin around the block with lots of different media, as well as games. A range of games allows a headset to reveal its limitations and strengths, but it’s also relatively likely you’ll keep them on if you fancy switching to a film late at night or plugging them into your phone to listen to music. Aside from getting used to the length of the cable and figuring out that this was just the nature of the beast, the jack also crackled an awful lot in the first 30 minutes or so of usage, with every slight movement of either my controller or my head or if I shifted my position a little. It seemed to settle down after a while - how I don’t know - but it was a little alarming and doesn't inspire much confidence. The Renga Boost is indeed intended and made to be a gaming headset, it is unashamedly that and no makes secrets of its direction and market pitch. Starting with the bottom end I gave it a spin with Doom and the crunchy basses, middles, and action shooter noises that are turned up to 11 in the demon-shooter behemoth. It fared pretty well here and immediately felt like it was most at home here. The bass was good, consistent and rumbly yet allowed enough of the middle range to come through and play its part too. However, it didn’t rock my socks off either; it was just good. Good but basic. The surround sound worked and was effective in a similarly basic way - It almost felt it couldn’t keep up in the really fast paced areas of Doom, almost like you could measure the exact spot that it changed from one side to the other like a clear line was being noticeably crossed. I’m currently playing Divinity Original Sin 2 so I gave this a go next, and it's a surprisingly competent game for testing voices, dialogue, and also middle-to--high end sounds given its medieval sounds and ambience that prevail throughout. The Renga Boost provided me with a passable experience here but definitely nothing to write home about. The middles and the treble and heavy medieval-esque music were presented to my ears quite well, but the higher pitched trebles either in the music or from particular dialogues were just adequate. Inviting a friend to play Divinity with me allowed me to test the mic and multiplayer suitability (in a particular middle-to-high audio environment, granted). And it was fine, on the whole. My friend didn’t sound quite as good as I’m used to with my normal (more pricey) headphones but it was clear enough for sure. I was a bit loud to begin with but nothing that couldn't be immediately turned down. This was the same when we booted up The Division, with communication being no problem but just a bit quiet sometimes. The surround sound was OK in The Division too and was just about good enough to give me a general geographical heads-up of enemies and in-game cues but it still didn't feel quite as seamless and clear as in other competing headsets. The lasting impressions after all my testing was that the overall sound was quite quiet (and I had to do a lot of manual changes to get the right levels), and these are definitely not noise cancelling earcups. Though they aren't marketed as such, it feels pertinent to point this out as they also don’t quite cut you off naturally, as some headsets do. They don’t quite immerse you as much as others can and have done for me - even at this lower end of the budget. This might not rank highly for you, but if you want to be totally focused in game then these might not be for you. Elsewhere, hearing audio cues from the world wasn’t as good as other headsets I’ve tested but this is probably a fair trade off given its price-point, and that surround sound was passable but just not as seamless and neat as other headsets. The limitations in sound range were replicated in movies and music too and so I couldn’t recommend them as a go-to headset for non-gaming media. There just isn’t enough there to push out the overall range and quality needed for TV, films, and music - unless the sound range is firmly in the bass regions. Comfort wise, the Renga Boost headset was also just OK: not brilliantly comfortable, but not immediately awful. The earcups felt a little too large and circular that they slipped occasionally, and the headband is soft so doesn't impact comfort on your head but doesn’t hold as fast and steady as others. Roccat say the ear cups are ventilated to decrease heat but my ears got quite quite hot quickly whenever I used them. All that being said, they're not take-them-off-immediately uncomfortable and one thing the headset had going for it in that respect was the overall weight - it had a weight that you could imagine not noticing after a while and thus wearing for ages. If its other component were suitably comfortable. The Roccat Renga Boost is a curious beast. It’s got the bones of a decent headset but doesn’t quite execute them well enough to make it a stand out gaming headset. However, it is most easy to recommend for PC users, as this is where it felt most at home, particularly when playing shooters like Doom. It perhaps might also serve as a useful stop-gap for those who need a headset now but maybe are saving up for something bigger later down the line. Overall it feels hard to totally recommend, despite its attractive price point: the Turtle Beach Recon 200 I reviewed recently is in the same price range and knowing that, if you asked me for advice on a $60/£50 headset then I wouldn't hesitate in recommending the Recon 200.